When replacement is necessary, use the following procedure. 1. Using a screwdriver, loosen the screw on the backside of the transmitter then use a thin tool to pry open the transmitter. 2. Disassemble the transmitter and remove the battery. 3. 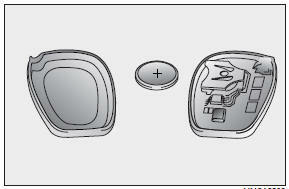 Make sure the battery positive “(+)” symbol faces up as indicated in the illustration.